As a busy stay-home-mom, I’m always on the lookout for cookware and gadgets that can help me save time in the kitchen. That’s when I found Tiger thermal magic cooker NFB-C520 and went on to get one. This so called ‘magic cooker’ could cook anything from a soup, stew, congee to yogurt and cakes. Not only that, you only have to spend a much shorter time doing any actual cooking. If you’re wondering what is a thermal cooker and thermal cooking, this article explains it. Only the inner pot is washable. To clean the outer container, just wipe with a damp cloth. Saves Time on Cooking: The first thing that I cooked with my Tiger Thermal Magic Cooker was a soup. Usually for a slow simmer soup, it requires 2 to 3 hours of cooking time on the stovetop. But with the Tiger Thermal magic cooker, I only have to cook a soup for about 30 – 45 minutes on the stovetop. I was very pleased to discover that it was able to coax out the flavors from the ingredients into the soup even though I cooked it for a much shorter time than I normally would. Retains Heat Effectively: Food stays warm for at least 6 hours and I normally do not have to re-heat. A God-send for Soup Lovers: Just cook the soup on a stove for about 30 minutes or so before you let the thermal cooker take over and work its magic. 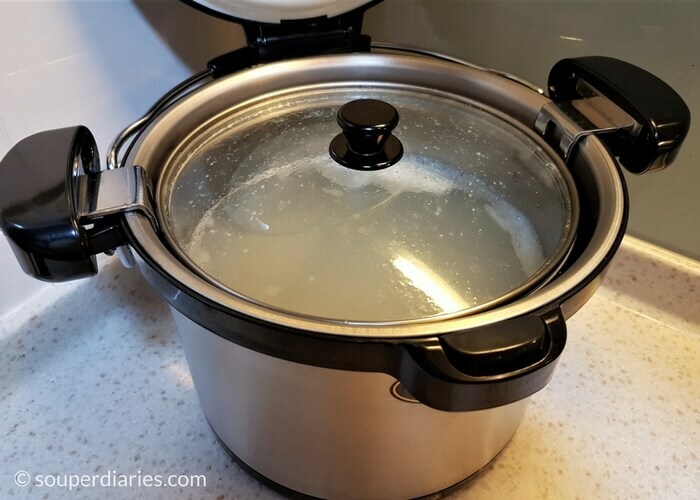 Usually, I’ll prepare my soups in the morning with the thermal cooker and by lunchtime, it will be ready to eat. 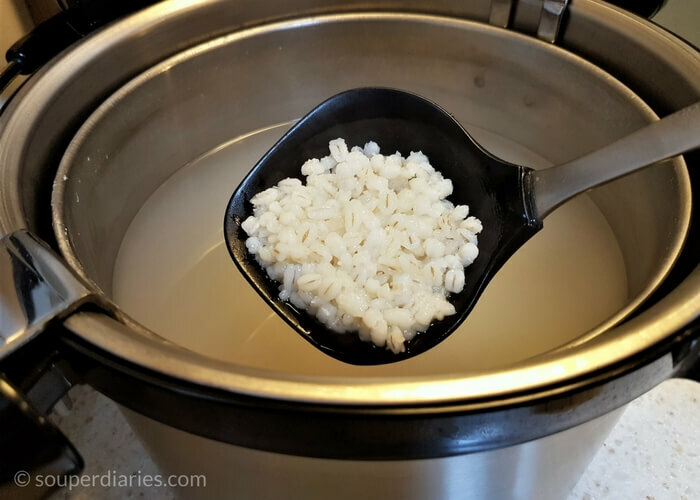 Versatile Cookware: Besides soups, my next favorite thing to make with the Tiger thermal magic cooker is yogurt. It is a wonderful incubator and my yogurt turns out delicious and thick every time. So far, I’ve also made stews, congee, chicken stock and desserts with my thermal cooker. 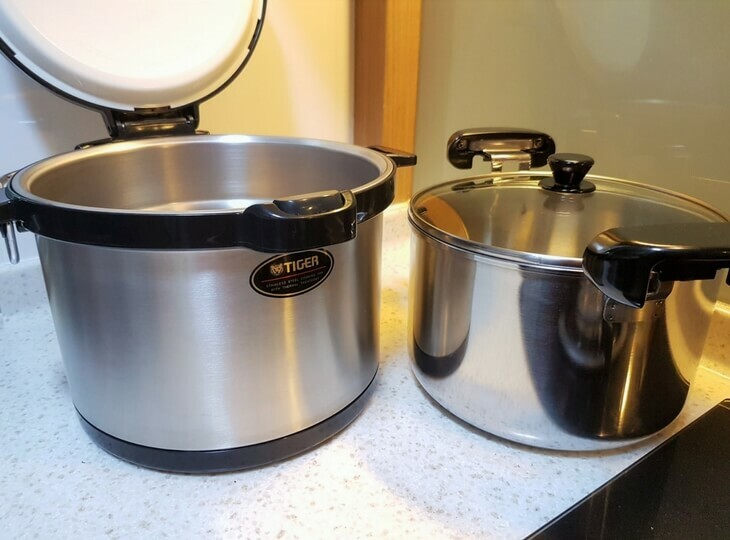 Wide Base: Compared to other thermal cooker brands, it has a wider base so you can brown your meats more comfortably if you’re cooking a stew, for instance. That said, the inner pot does heat up rather quickly so keep an eye on your aromatics to prevent them from getting burnt. 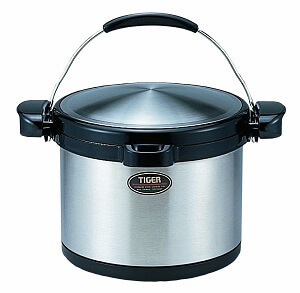 No Second Inner Pot: Unlike some other thermal cooker models, at the time of writing, Tiger thermal cookers do not come with a second inner pot. So you can only cook one dish at a time. How Effective is the Tiger Thermal Magic Cooker? 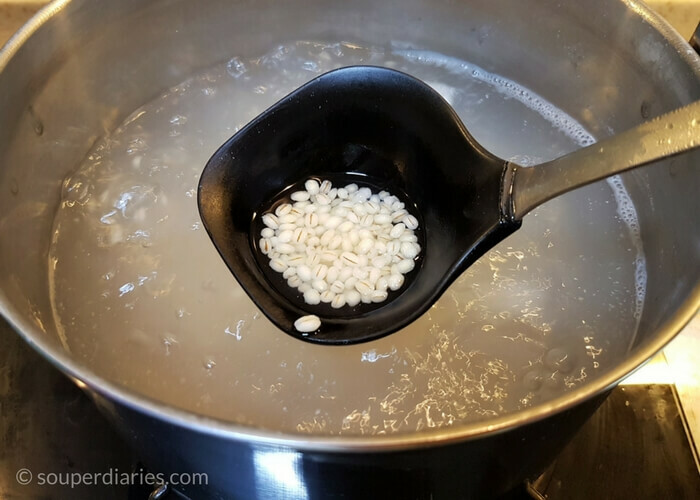 Recently, I’ve been boiling barley water quite regularly as my little boy had a recurring fever and drinking barley water will help to cool his body. I did a little experiment to see how well the thermal cooker would perform with just 10 minutes of cook time on a stovetop. (Note that the duration does not include the time to bring the water to a boil). First, the barley water is brought to a rapid boil. Then I cooked it on medium-high heat (with lid on but slightly opened to prevent the barley water from bubbling out) for 10 minutes. At this stage, the barley is still slightly hard and the water not ‘thick’ enough. After 10 minutes of cook time on the stove top, I placed the inner pot into the outer container. This has to be done carefully yet quickly so as to conserve as much heat as possible inside the thermal cooker. Close the lids for both the inner and outer container and let the trapped heat finish the cooking. After 1 hour in the thermal cooker, the barley has softened nicely and the water is cloudy and ‘milky’ enough for my liking. They will get softer the longer you leave them inside. After 6 hours, the barley water is still warm. There are many thermal cooker models in the market so it made choosing a suitable thermal cooker rather difficult. Finally, I decided on Tiger as it has a wider inner pot compared to other models. I figured this would make cooking with it a more comfortable experience. Even so, once I got the cooker, I had some regrets initially due to the size of the pot. I thought that I had to fill up the pot as much as possible to retain more heat for cooking. With this NFB-C520 model, this would work out to about 15 cups of water which is too much for me. I’ve since learnt (from the operating instructions) that for the most effective cooking, I should not overfill the inner pot. In fact, 80% full is the recommended amount. So phew! This size is just right for me after all as I usually fill the inner pot with about 8 cups of water when boiling soups. However, this thermal cooker is not without its flaws. Whenever hot food is placed in the inner pot for several hours, I noticed some water droplets on the inside of the outer container when I opened the outer lid. But this is a minor gripe. It does not detract from its cooking abilities. What I do is simply wipe them away with a kitchen towel. Problem solved. Tiger thermal cooker reviews on Amazon are mostly favorable. However, I noticed an Amazon user commented that his cooker (model NFH-G450) had marks on the inside of the inner pot after cooking. I have experienced that too. To solve this issue, I just use a little Cif cream cleanser to clean the stains. Then rinse with water and wipe dry. Voila! My pot looks as good as new. The picture below shows the inner pot of my Tiger thermal cooker after 1 year of usage. No stain marks at all. This is the inner pot of my Tiger thermal cooker after 1 year of usage. I clean and dry my pots diligently after every use. This short video below shows how the Tiger thermal cooker work and the different sizes available. I’ve been using the Tiger Thermal Magic Cooker ( NFB-C520 ) for about a year now and in my opinion, it is a great investment for the kitchen. If you’re looking for a thermal cooker that not only does a great job of cooking liquid based food but also fry comfortably, then I strongly recommend this Tiger thermal cooker. It is a great kitchen tool for busy parents and individuals looking for an energy efficient cookware. I wish that I bought this earlier as it helps me to save on time, energy and money. As shown in the video above, Tiger thermal cooker comes in various sizes and specifications. Click here if you wish to find out more. If you reside in Singapore, you can also find Tiger thermal cookers here. 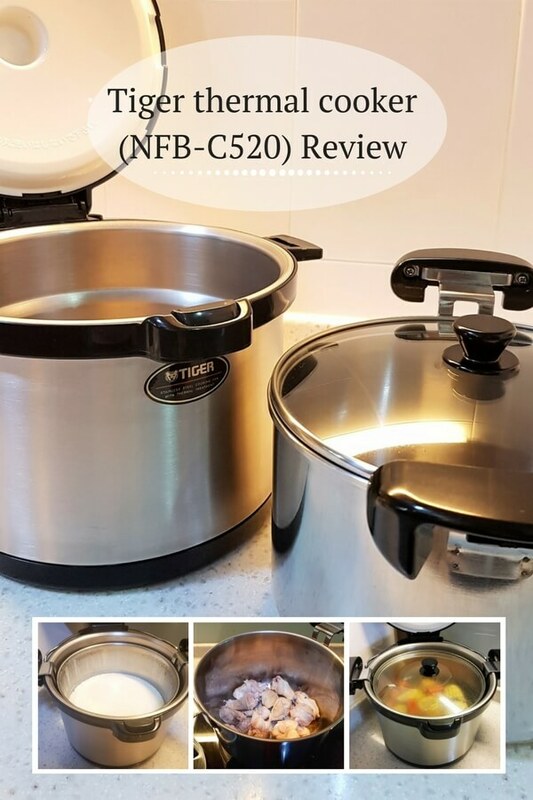 I hope this review helps you to determine if Tiger thermal cooker NFB-C520 is suitable for your cooking needs. If you have any questions or experiences about using Tiger thermal cookers, please leave a comment below. I’ve been on the lookout for a thermal cooker since I read your review on what is a thermal cooker. Still have not decided on which one to get and when. This Tiger brand looks great, and since you vouch for it as well, and shown the condition of it after one year’s use I am more inclined to go with this one. Thanks for an informative review! This was a spectacular post! I loved this post, was really interesting, please post more! I’m glad you enjoyed the review. You may want to subscribe to my website for the latest updates to be emailed to your inbox. See you again! What can I say that you already haven’t. 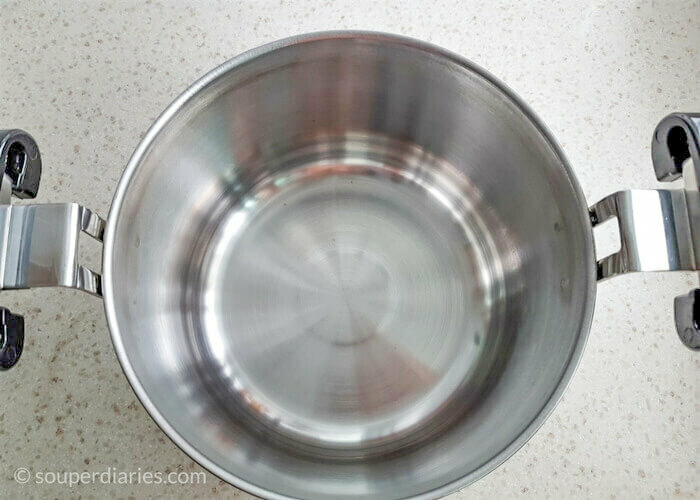 This was a very good and thorough review of the Tiger Thermal Magic Cooker. I can see myself using this a lot. I love the fact that I can start a dinner, and then let it sit to finish cooking…on the counter! You did a great job of explaining the benefits. I am truly wanting to purchase one, just need to wait until we get moved into our new home. Thanks, Leahrae. I’m glad you like the Tiger thermal cooker review. I leave my thermal cooker on the counter top too. I hope you’ll enjoy enjoy using a thermal cooker as much as I do! Wow this seems amazing…or dare i say magic! I do have the same issues as you in regards to having to cook and run errands and i find the task of multitasking a bit of a struggle sometimes. Haha, yes it does seem like a magic pot! It is a very useful tool in the kitchen and I find it especially useful on busy days. This looks so cool. I need to get one. Good information, and the photos helped. This looks so cool, I gotta get one. Great information, and the photos helped.